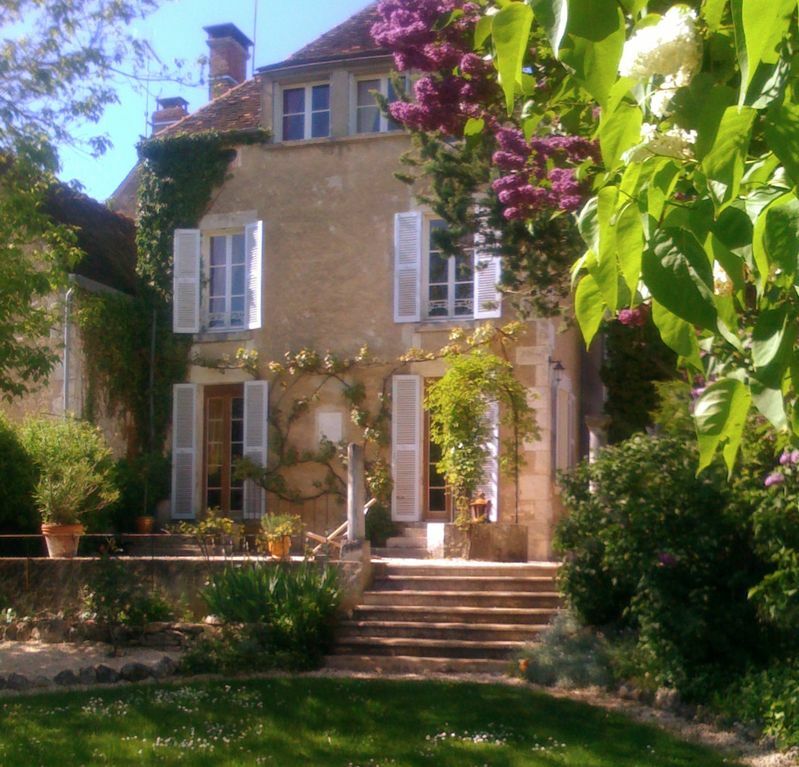 Situated in the heart of Burgundy, with beautiful Landscapes and magnificent Vineyards, this lovely property is ideally placed within easy reach of Chablis and Beaune, and many famous attractions, rich in French History and tradition. This wonderful 19th century Maison Bourgois, restored by the architect owner, has kept all its old charm with tiled floors and selected colours inside, now equipped with all modern amenities, which makes it cosy, elegant and comfortable. The 5 bedrooms are spacious, decorated with antique furniture and silk curtains. The dining room for 10 people is open to the lovely new but old-fashioned well-equipped kitchen, and with a huge gas oven that makes it a pleasure to cook Burgundian cuisine. The living room has a huge stone fireplace, a grand piano and two double patio doors straight to the garden and the terraces with tables and chairs, to dine in the sun or in the shade under the terrace-roof. This house is exclusively for you, with private pool and beautiful 4000 m2 - 40.000 sq.ft private landscaped garden, enclosed by stone walls. The garden has big spaces for children, and a rich array of fruit trees and flowers – lilacs, roses, tulips. The kitchen garden with lettuce, tomatoes and herbs is a delight. Birdwatchers will love the sound of swallows and goldfinches singing. The heated 5 x 10 meter swimming pool in blue mosaic is enhanced by the perfume of the lavender border. On the grand piano in the living room you will find a map indicating where to buy, to dine, and what to visit. Shops, bars and restaurants are all within walking distance, and a wealth of vineyards are a short drive away. There are numerous monuments in the region to be visited - Vezelay, a hilltop village, famous for the St Magdalene Basilica - magnificent ! 25km from the house, and with many nice shops and restaurants in this medieval city. The Abbey of Fontenay is also in the region: both are listed by UNESCO as World Heritage Sites. Four bicycles are at your disposal; there are wonderful trails nearby for biking and jogging. Many different châteaux such as Bazoches and St Fargeau are nearby, as well as the great vineyards of Chablis, Irancy, Côtes d'Auxerre, Beaune, Cote de Beaune and Côte de Nuit. The region is sprinkled with art and history treasures. There are maps and guidebooks in the living room at your disposal. You will also find TV, DVD player and CD system with a fine selection of classical music and jazz. There is a great selection of books on literature, art, architecture and more. The property is easily reached by A6 motorway from Paris in less than two hours, or by direct train. It's a outstanding house in an outstanding huge garden in an outstanding countryside. Bathroom 1 with oak floor, antique furniture. Bathroom 2 with old beams in the roof, tiled floor. 3 Tennis courts near by. Badminton court in the garden. Birdwatching in garden: swifts, swallows and goldfinches. Wonderful outdoor dining. Parasol available. Covered outdoor dining also. Poolside table. Kitchen appliance: juicer; fruit press Kitchen garden: lettuce, tomatoes, basil, chives mint, parsley, rosemary. Fruit trees: mirabelle, apple, quetsche, cherry. Walnuts. Beautiful flowers in season: roses, lilacs, tulips The pool is bordered by lavender. We loved our stay at the house, lovely long garden and super pool (after we asked for it to be cleaned). The outside covered eating and bbq area was perfect. This is a “shabby chic” property with an unpredictable oven and NO air conditioning. But still a lovely family home. Thank you for your nice description of our lovely property. The pool was clean but had leaves on the bottom because of wind and the tenant before you that didn't cover the pool. Lovely house in quiet village location. The garden is spectacular, really beautiful, peaceful, magical; a delight! Swimming pool was very nice, a godsend on rare hot days. Village was small and friendly. Baguettes sold each morning in the pub within a stones throw. Would highly recommend this for an escape for some down time. It suited our small family very well. I would not want to go there with a group of 10, particularly non-family members as I do not think it would cater well for this- plenty of beds but only 2 bathrooms and no large tables to sit around, but for a small group looking to escape the strains of busy life in a charming surrounding it was perfect. The house was very stylish. I imagine it would be lovely in winter too with the nice log fire. Well positioned for our needs. Clean and tidy. Welcome on arrival was perfect. The accommodation was exactly as described with comfortable seating and the most wonderful open fire. The kitchen and dining area was suited to 8 guests, and there appeared to be a problem with the cooker thermostat. It didn't stop us cooking. The weather was disappointing as we had hoped to use the pool, which Jon had kindly opened for us just in case. The village itself was quiet, but Clamecy was only a short drive. We were fortunate to be able to celebrate such a fabulous New Year in such beautiful surroundings. Despite the bitter cold outside, the house was lovely and warm and the cosy fireplace created an inviting atmosphere and became the centerpoint of many a delightful evening of food, wine and joyful banter! The countryside offered many enjoyable and cultural outings and charming villages to stop for long lunches on the way! We would definitely consider a spring or summer visit to enjoy the lovely gardens and pool and explore the area further. As a newly established family of three, we happily exchanged our jobs and stressful big city life for a calm and peaceful September month on parental leave with our new-born son in Crain, France. The beautiful and well restored house, the perfectly planned private garden, the sound from the village church bell and the landscape surrounding it all, offered us the calm peacefulness that we were in search for. The well equipped kitchen soon became the center for our daily activities, using plenty of time to plan and prepare great “slow-food”, being creative with the fresh supplies we found on the village markets. The private garden was rich with fruits, fresh herbs and vegetables that gave us plenty of ideas and delicious ingredients for dinners, deserts and marmalades. Along with the gardens generous nature, it provided us with an intimacy and privacy whether we were walking or playing around in it, preparing ourselves breakfast, lunch or dinner in the beautiful green scenery or allowing yourself a refreshing swim in the pool. The village surroundings has plenty of great stroller walks in the nearby woods, along the riverboat canals or crossing the cultivated fields covered with oats, corn and wild flowers. For longer excursions into the neighbor villages or the Bourgogne vineyards, one becomes dependent on the car. The owner has collected a great number of travelling books side by side with a large collection of architecture and design book that comes handy for trip-planning, or general good reading on a rainy days. The house in Crain is highly recommendable for young adults and families with interest in great food and wine, spending a slow pace vacation in peaceful, charming and beautiful environments. We spent the most wonderful time in your beautiful home, relaxing, reading and writing. The pool with its lavender border is fabulous. It was a treat to prepare meals using the fresh lettuce and herbs from the garden. Enjoying lunch and dinner in the lovely garden or by the pool was so nice. It is truly a little paradise in Burgundy! We enjoyed visiting Vezelay and went for a picnic in Pierre Perthuis. The nearby markets, shops and restaurants are excellent. We hope to return soon with friends. The property is on the outskirts of a small village. This beautiful spacious home, restored by the architect owner, has a 40,000 sq.feet private landscaped garden, a 5m x10 m heated mosaic-lined swimming pool and badminton-court, enclosed by stone walls. The enchanting garden, rich with flowers - lilacs, roses, lavender, tulips; fruits - cherries, wild strawberries, apples, quince, mirabelle; and trees - walnut, linden fir and juniper - is really a paradise for adults and children. Excellent shops and restaurants in the vicinty. Wonderful area for jogging and biking; tennis courts nearby. The property is easily reached by car from Paris in less than two hours by the A6 Paris-Lyon motorway, or by brand new train direct from Paris Bercy to the railway station within walking distance of the house.